Senior Chris Bruce drops the hockey "puck" for the face-off between Dan Grosso and senior Josh Blase. 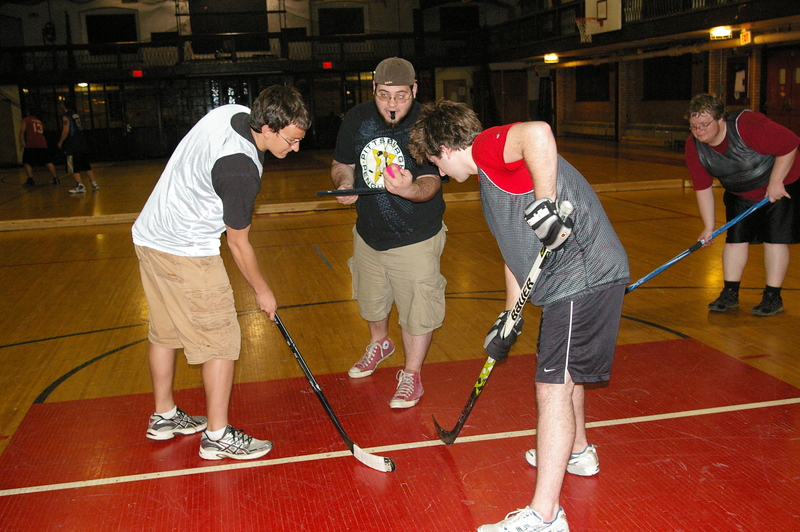 The Hockey Club plays deck-hockey in Sullivan Gym. The Seton Hill University (SHU) Hockey Club is one of campus’ fastest growing student clubs and is an excellent venue for students who enjoy hockey to have fun and meet new people. “I’m from California and we don’t get to play a lot of hockey there,” said junior and club president Adam Narlock. The club meets 2-3 times a week in the Sullivan Gym—typically on Tuesdays and Thursdays and sometimes on weekends. The games are usually attended by anywhere from 8 to 30 people, and the typical game format is 4-on-4 with 10-12 minute periods. However, this varies depending on the number of people who attend. “Everyone gets together and captains pick teams, then we just play,” said Narlock. “I was never into hockey before, but now it’s my Seton Hill family,” said freshman Amanda Dumi. Despite being in their infancy as an official student organization, the Hockey Club is already enjoying great success with 20 to 30 active members and new people attending regularly. “Next year we’re planning to keep growing and contend for the Club of the Year award,” said Narlock.